Menopause Well Being has a proprietary blend of soy and herbal extracts rich in isoflavones, shown to provide menopause support by relieving discomfort and providing cardioprotective and bone-strengthening benefits. 50.000 Asparagus Root 5:1 Extract (Shatvari) [Draco] 100 mg per serving. 20.000 BLACK COHOSH 4-9:1 EXTRACT (Cimicufuga rhizome) 40 mg per serving. 20.000 GOTU KOLA 4:1 EXTRACT 40 mg per serving. 2.000 VITAMIN D3 – CHOLECALCIFEROL (100,000 IU/gram) 400 IU Vitamin D3 per serving. 617.648 CALCIUM CARBONATE GRANULAR (34% Ca) 420 mg Calcium per serving. 102.565 CALCIUM CARBONATE POWDER (39% Ca) 80 mg Calcium per serving. 50.000 EMBLIC MYROBALAN FRUIT POWDER (AMLA) (Phyllanthus emblica) 100 mg per serving. 50.000 SOY ISOFLAVONE 40% (NOVASOY) 100 mg per serving. 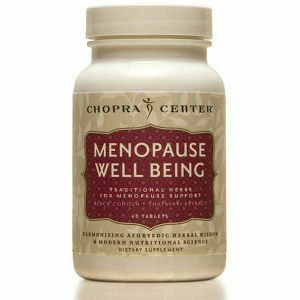 Take two Menopause Well Being tablets daily. 60 Tablets per Bottle. $28.00 for a 60 tablet bottle (a 1 month supply). The vendor offers a 30 day return policy from date of purchase for a full refund and also provides a contact phone number in product source information. on their website. This product is on the expensive side at $28..00 for a one month supply. Because the vendor source contains no testimonials there is no way to easily evaluate product effectiveness. by using the vendor source. While a prospective purchaser is not taking a costly risk to try a one month supply (the product is available without a prescription) a prospective purchaser may still want to have the product reviewed by a physician or other health service professional prior to purchase. Jackie Horowitz	reviewed Chopra Center	on June 22nd	 and gave it a rating of 2.